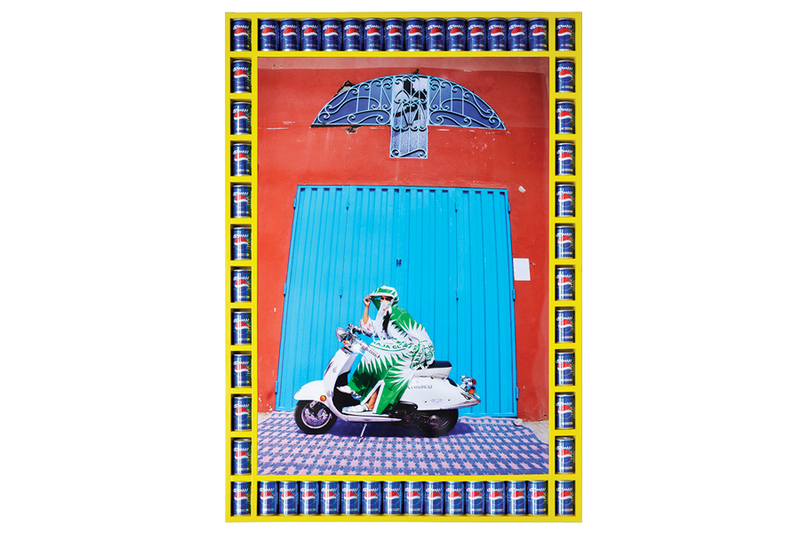 For its 2015 campaign, Sole DXB collaborates with internationally acclaimed artist, Hassan Hajjaj, otherwise known as the Andy Warhol of Marrakech. Hassan creates a set of vibrant images and pop art series featuring iconic brands and people. These artworks embody Sole DXB’s shared ethos around art, music, fashion and urban lifestyle, offering a refreshing perspective on street style and Middle Eastern flair. The hero shot is full of vibrant tones and his pop art series connect the Western world to the East. Celebrating the regions cultural heritage through art and talent, we see the rise of Hassan’s subject Mr Amine Bendriouich, the Berlin based designer. The custom made jacket by Hassan and Amine, represents the burgeoning creativity bubbling in the region, as Sole DXB is at the forefront of emerging talent in the city. Hassan’s styling and use of props offer insight to his cultural roots and heritage. The vintage Pepsi crate and paint bucket continue Hassan’s dialogue of artistic re-imagining and demonstrate his varied work techniques and fields. Hassan’s roots in urban street culture has lead his work to celebrate young locals on the streets of Morocco and simultaneously capture stereotypes of the people of North Africa. Using references from popular culture and iconic brands, Hassan’s art has become synonymous with the pop culture era. As we see Sole DXB’s campaign shift into colour this year, from its origins in black and white, Hassan’s vivacious work personifies the growing culture of the region. Be sure to swing by and watch Hassan at work with his live shoot and art installation 20th & 21st November 2015 at Sole DXB. Hassan Hajjaj is represented by The Third Line, Dubai.